Oh that title is so misleading. But if you squint your eyes and scratch your noggin it’s almost true. Thanks to the hard work of [Peter Lawrence] it is now possible to hack together an extremely inexpensive CMSIS-DAP ARM debugger. Let’s talk about function and we’ll get back to cost later. CMSIS-DAP is a standard that gives you the kind of breakpoint control you expect from a proper debugger. In this case [Peter] implemented the standard using 4k words of space on a PIC 16F1454. This lets it talk to the debug port on ARM chips, and the bootloader (also written by him) doubles as a USB-to-UART bridge. Boom, done. OpenOCD (and a couple of other software packages) talks to the PIC and it talks to the ARM. Nice. Back to the cost question. You can get a 16F1454 for nearly a dollar when you order in quantity. If you cut up an old USB cable, recycle some jumper wire, and already have power and decoupling on hand, you’re in business for nearly one dollar. [Charles] and his brother have been members of their school’s FIRST robotics team for many years, and using some of the knowledge they acquired during it, they have put together this awesome all-terrain, super over-powered, RC car — and soon to be robot. It’s built like a tank using 1″ square steel tubing and custom corner brackets made of 1/8″ thick steel. Heavy duty U-bolts hold the over-sized 5/8″ axles, and everything is driven using #35 roller chain. A large 12V sealed lead acid battery powers two CIMs (FIRST Robotics motor) with the AndyMark CIMple gearbox — these give the car tons of torque, and it can even do wheelies! The really cool part of this project is the method of remote control. He’s using a regular old Xbox controller that an Arduino Uno listens to through a USB host shield and the original Xbox USB receiver. Simple, but totally effective. 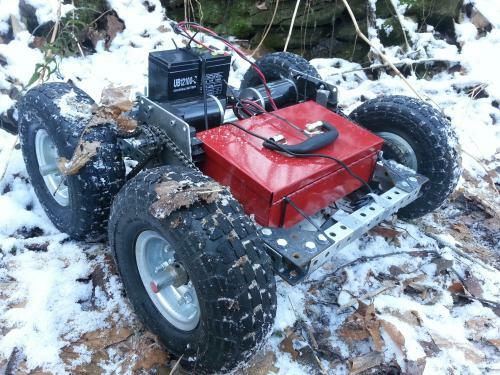 The project is not yet complete, and he’s planning on fully equipping it with lights, a larger battery, a roll-cage, a camera system, and some kind of manipulator tool. Check out the test drive video after the break! When we visited the Crash Space hackerspace earlier this week, it came to our attention we were staying mere blocks away from Deezmaker, a 3D printer store in beautiful Pasadena that is home base for the Bukobot and Bukito printers, an awful lot of awesome printed plastic things, and [Rich] a.k.a [whosawhatsis], creator of the RepRap Wallace and all this stuff. Obviously a tour was in order. Inside Deezmaker is a treasure trove of printed baubles and a fishbowl full of a herringbone planetary gear systems free for the taking. They have printers running all the time, a very nice lab for [whosawhatsis], and enough work space to host a few workshops every week. In the video below, [Diego], the big cheese of Deezmaker takes us around the shop showing off his wares. [whosawhatsis] also makes an appearance showing off his latest invention, the Bukito printer. It’s a very small and incredibly portable printer that can be powered by batteries. They’re using a 3-cell 5000mAh lipo battery when they take the Bukito camping. I didn’t catch how long the battery lasts, but it’s more than enough to squirt out a few of the gear systems they give away. In case you haven’t heard, Hackaday put on a little shindig in downtown LA this past Tuesday. It was awesome. And we had a few very awesome visitors: [Eliot], senior editor of Hackaday for the first five years made a showing, as did former co-editor [Jack Buffington]. Eminent LA-area hackers came out, including [charliex] of Null Space Labs, the guys from Deezmaker, and the long-haired hippie who can be found in a few NASA videos for the Curiosity rover. Aside from the free drinks and the awesome people, there was some really cool tech on display. The mezzanine of the bar had a laser graffiti rig, and everyone who came received a super collectible NFC card that allowed them to vote on what Hackaday is doing for our next main event (the quadcopter option won but the vote was non-binding so we’ll keep you updated). On a personal note, this was one of the few times I’ve interacted with Hackaday readers without the use of a keyboard. You guys are awesome. Thanks for coming out, and if you have any pics from the party, post a link to an album in the comments, or share your stories with us on Twitter via #HaDLA, Google+, and/or Facebook. If you need some sort of distance sensor for your robot, drone, or other project, you have two options: a cheap ultrasonic sensor with limited range, or an expensive laser-based system that’s top of the line. LIDAR-Lite fills that gap by stuffing an entire LIDAR module onto a small board. In traditional LIDAR systems, a laser is used to measure the time of flight for a light beam between the sensor and an object. The very accurate clock and laser module required for this system means LIDAR modules cost at least a few hundred dollars. LIDAR-Lite gets around these problems by blinking a LED with a ‘signature’ and looking for that signature’s return. This tech is packaged inside a SoC that reduces both the cost and size of a traditional laser-based LIDAR system. As for the LIDAR-Lite specs, it can sense objects out to 40 meters with 5% 95% accuracy, communicates to any microcontroller over an I2C bus, and is small enough to fit inside any project. Considering the existing solutions for distance measurement for robots and quadcopters, this sensor will certainly make for some very awesome projects. [ZigZagJoe’s] first foray into astrophotography is this impressive AVR barn door tracker, which steps up his night sky photo game without emptying his bank account. If you’ve never heard of astrophotography, you should skim over its Wikipedia page and/or the subreddit. The idea is to capture images otherwise undetectable by the human eye through longer exposures. Unfortunately, the big ball of rock we all inhabit has a tendency to rotate, which means you need to move the camera to keep the night sky framed up. Most trackers require precision parts and fabrication, which was out of [ZigZagJoe’s] grasp. Instead, he found a solution with the Cloudbait Observatory model, which as best as we can tell looks vaguely similar to the tracker we featured last year. Unlike last year’s build—which uses an ATmega32u4 breakout board— [ZigZagJoe’s] tracker uses an ATTiny85 for the brains, running a pre-configured table that determines step rate against time.